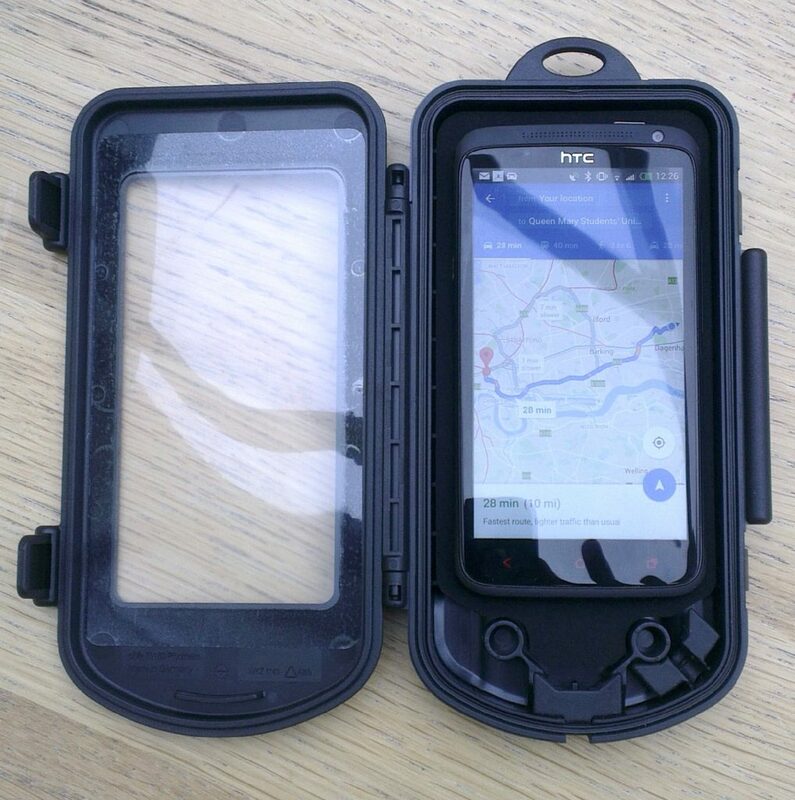 When it comes to satnav’s on a motorcycle you basically have two choices: splurge a tonne of cash on a proper water proof and rugged device from the likes of TomTom or Garmin; or you make do with the smart phone you already have. With the latter cheap skate route you either make do with audio direction only and keep your phone in your pocket or you look at a waterproof case to mount to handlebars. This is where this Herbert Richter phone case and mount comes in. The charging cable is particularly crucial, as any satnav app is going to drain your phone’s battery pretty quickly and many cheaper cases don’t facilitate poking a cable through them and remaining water tight. Installation was easy, the mount is just a basic U shaped clip with two Alan bolts. Though one is a little tricky to access due to curvature of the mount. The phone case itself require a knack to open, but can easily be removed from the mount, so if desired you could leave the phone in there (but it is pretty bulky). The case easily clips onto the mount, via spring loaded mechanism. It also has a rubber band you can wrap over to act as an extra safety fallback. The case contains a removable layer of foam to accommodate different thickness phones. It’s supplied with some round stick on foam pads to go around edges to better suit different phone sizes and stop them sliding about. 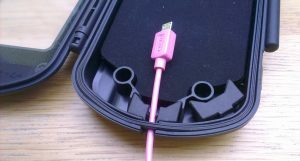 The charger cable is easy to slot in; the case comes with two rubber gaskets for the bottom hole, one blocks it complete and one surrounds a charging cable. The spare one is kept in the case, so shouldn’t get lost. However, the key thing I overlooked on ordering this, was the fact my HTC phone has it’s charging socket on the side and not at the bottom! The case simply isn’t wide enough to accommodate the USB plug in the side of the phone. 🙁 Since most phones have a charging socket at the bottom, this should not affect many though. 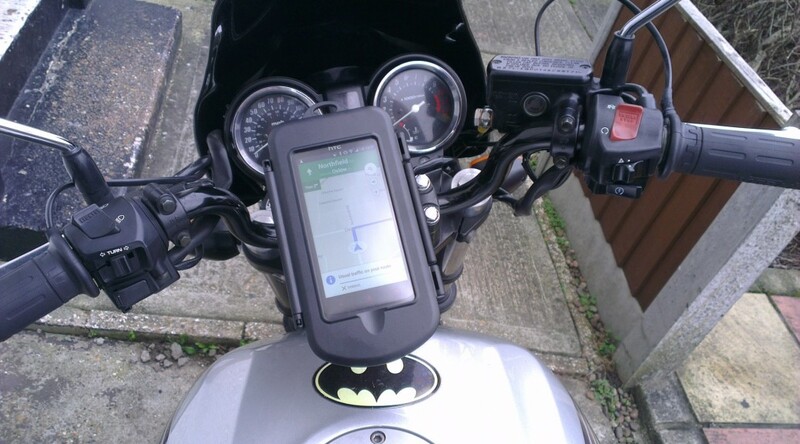 Although I did find a number of issues with general plan of using a smart phone as a satnav. 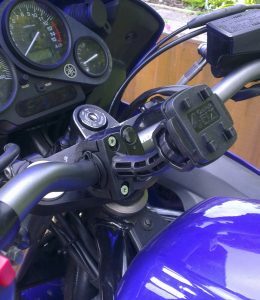 I had no issues with the mount when riding along, it was study and proved waterproof. Although I did find a number of issues with general plan of using a smart phone as a satnav. I relied mainly on audio directs as it felt distracting glancing down at the screen when riding, I can see why many adventure riders opt for satnav mounts higher up above the clocks. When my phone’s screen brightness was set to auto, it would often be too dim to make out, but manually setting it to brightest resolved this though (at the expense of battery). The Google maps app crashes often. Google maps audio directions are quite lengthy and so I’d find myself past a junction it’s still talking about. It drained the battery like crazy. Overall, this Herbert Richter mount is a decent bit of kit and does exactly what it supposed to do, and well. My reservations really lie with using a smart phone as a satnav. Some of these I’m sure could be addressed with a better phone or other navigation apps, but I doubt it will ever be as elegant a solution as a proper satnav. But then we’re only talking about a £30 outlay here. You get what you pay for. Find Herbert Richter phone mounts on ebay.